On December 2, 2010, FIFA president Sepp Blatter stood before a giant blue screen at his organization’s headquarters in Zurich and announced the two countries that had won the rights to host the 2018 and 2022 World Cups. After hours of presentations and last-ditch lobbying efforts from Prince William, David Beckham, Morgan Freeman, and Bill Clinton, FIFA’s 24-man executive committee — down to 22 after two members were caught trying to sell their votes to undercover journalists — had elected Russia and Qatar to follow Brazil as the next hosts of soccer’s biggest tournament. On the face of it, the choices were surprising. FIFA’s inspection team had evaluated all nine bids1 and rated Russia and Qatar as the riskiest of the lot. Russia presented major infrastructure problems. Qatar got so hot in the summer that the inspectors deemed a World Cup there a “potential health risk for players, officials, the FIFA family and spectators.” Nevertheless, Blatter, a winking, bald-pated 75-year-old from FIFA’s home country of Switzerland, looked overjoyed as he read out the results. “I am a happy president,” he gushed. FIFA has a longstanding reputation for corruption, and even before the executive committee convened, there was widespread concern that the voting would be rigged. Alarming details had been leaking out for months. In October, Sunday Times reporters posing as American lobbyists had secretly videotaped two ExCo members, Tahiti’s Reynald Temarii and Nigeria’s Amos Adamu, demanding hundreds of thousands of dollars for their votes. They each claimed that the money would be used for development projects — a soccer academy in Auckland, New Zealand, four artificial fields in Nigeria — but wanted the money to be paid to them directly. Three days before the vote, the BBC’s Panorama program broadcast an investigation into FIFA corruption that accused three current ExCo members of taking bribes in the 1990s. In the weeks after the vote, the suspicion intensified. It was noted among the losing nations that the committee had handed the World Cup to two oil-rich countries with troubling, arguably outright authoritarian governments. In doing so, it had voted down bids — including those from the United States, England, and Japan — that outperformed the winning nations in both tournament-readiness and revenue potential. England’s bid, one of the most highly praised by the inspection team, received a paltry two votes. Multiple newspapers reported that the delegates from CONCACAF, the governing body of North American soccer, had voted against the country from their own confederation, the United States. FIFA had faced this sort of suspicion before. Both Blatter’s election as president in 1998 and his first reelection campaign were dogged by allegations of bribery. The old boys on the ExCo — it has never had a female member — had long been rumored to buy votes, manipulate TV deals, get fat on corporate kickbacks. Sometimes there were more than rumors. In 2006, Jack Warner, the head of CONCACAF, was censured by FIFA’s Ethics Committee when an Ernst & Young audit found that he’d made a million-dollar profit selling World Cup tickets in Trinidad. None of this had ever really fazed FIFA. But the rumblings about Russia and Qatar persisted for months, and they came at the worst possible time for Blatter. His third term as president was up in June, and he faced an unexpected challenger in the election: Mohammed bin Hammam, the Qatari head of the Asian soccer confederation and a key mover behind Qatar’s successful World Cup bid. Bin Hammam had once been known as a Blatter loyalist; now, somewhat breathtakingly, he was capitalizing on the widespread mistrust of Blatter by running for the presidency on an anticorruption platform. Should it matter to soccer fans if FIFA is corrupt? By almost any measure the game is thriving, with more fans in more corners of the world, every day. If the combined audience for just the final two rounds of the 2010 World Cup were a country, it would be, by far, the most populous nation on earth. Most of these fans seem to be enjoying themselves, so if a cabal of scheming old men in Zurich happens to be pulling strings behind the scenes, why should the rest of us worry? It’s easy to see FIFA as unimportant in part because, as the Blatter-bin Hammam wrangle illustrates, there’s something deeply silly about many of the organization’s Machiavellian twists. One of the common misconceptions about FIFA corruption is that it flourishes because the organization is rolling in money. In fact, if FIFA were a corporation, its revenue of just more than $1 billion a year wouldn’t get it within a Tim Howard goal kick of the Fortune 500. In 2010, ExxonMobil raked in $284.6 billion; Blockbuster Video, the 500th company on the list, had revenues more than four times the average for world soccer’s governing body. By the global scale on which it operates, FIFA is at best a medium-sized outfit. And it’s the organization’s middlingness, combined with its exposure to much larger economic powers, that determines the peculiar character of its scandals. FIFA executives tend to be vain bureaucrats and unctuous politicians rather than cutthroat businessmen. From an economic standpoint, their only real purpose is to control the point of access to the World Cup, from which the organization derives 87 percent of its income. FIFA’s top executives are thus in a position to be courted around the clock by massive corporations, which want to secure one of the competition’s prized sponsorships, and by governments, which want the prestige of hosting the tournament. It’s easy to imagine how a sports administrator’s ego would unfurl under these conditions; the majestic, indomitable beard of Chuck Blazer, the American functionary who wrote the report accusing bin Hammam,2 provides a useful visual aid. As a result, the FIFA corruption stories that become public — and there are presumably many that don’t — tend to be silly, tawdry, or decadent rather than chilling or deeply outrageous. They’re just a bit of glitzy filth, the mildew of globalization. The best recent example of this is the case of Lord Triesman, the former chairman of the English Football Association and head of England’s 2018 bid. In May 2010, Triesman was ousted from both roles after a former aide secretly taped him saying that Spain and Russia were trying to bribe World Cup referees. A year later, as bin Hammam and Blatter were plotting against each other in Zurich, Triesman appeared in London, testifying before a parliamentary committee about the failure of England’s bid. The location was significant. Under Europe’s stringent libel laws, making accusations, even against public figures, can lead to heavy penalties. Speak under parliamentary privilege, however, and you’re immune from legal action. Best of all was Triesman’s meeting with Nicolás Leoz, the six-term president of the South American soccer confederation. “I was guided from the table,” Triesman said, “to a display cabinet, in which there was a large book.” In the book were facsimiles of the honors Leoz had been given by various countries — knighthoods, photos of streets that had been named after him, and so on. Leoz told Triesman through an interpreter that “he believed the appropriate way of recognizing his achievements in world football were not by money, he didn’t need money, he already was personally a very wealthy man.” Instead, Triesman continued, “I was shown the facsimile of his Légion d’honneur.4 I was then told, through the translator but directly after he had spoken, that he believed that a knighthood from the United Kingdom would be appropriate. And it was put to me that as a former Foreign Office minister, I must know how these things are organized and could probably achieve it. Did any of this really happen? It almost doesn’t matter. Triesman’s portrait of FIFA as a rogues’ gallery of parasites accorded deeply with what everyone already sensed about the organization. On the other hand, his portrait of himself as a lion of British rectitude, shocked and outraged by each hint of impropriety, was so absurdly implausible that even if Triesman’s accusations against FIFA weren’t true, FIFA could still be regarded with suspicion simply for consorting with men like Triesman.5 The whole narrative sank into a soft bottom of rottenness. Like a scene in a comic novel, it felt detached from reality — something that sounded like the truth told in a way that sounded like lying. The pivotal moment in the history of FIFA corruption came in the summer of 1974. That year, West Germany upset Johan Cruyff’s Netherlands at the World Cup; the Jules Rimet trophy, which was actually held by the winners, was retired in favor of the FIFA World Cup trophy, which was awarded only in replica; and João Havelange, the tall, grim-faced head of the Brazilian Sports Confederation, was elected as FIFA’s seventh president. Under Havelange’s predecessor, the Englishman Sir Stanley Rous, FIFA was not notably corrupt, only racist and Eurocentric. Rous, who was born during the reign of Queen Victoria, championed values of amateurism; as a young man, he had served as a referee. As president, he alienated FIFA’s non-European contingent by resisting efforts to expand the World Cup — in the 1966 tournament, there was one spot reserved for Asia and Africa combined — and by supporting apartheid South Africa’s right to a place in world soccer.6 Rous’ FIFA was hopelessly outmoded, an artifact of the game’s colonialist past. First, only the very largest multinational companies, whose advertising budgets could bear the load and whose global reach matched the TV audience on offer, should be approached as sponsors. Second, sponsorship and advertising would be segmented by product type: There could be only one soft drink, one beer, one microelectronics firm, or one financial services company that could be the official World Cup product or supplier. Third, FIFA would have total control over all forms of TV rights, advertising, stadium space, etc. Any and all existing deals in a host country would have to go. Fourth, FIFA itself would not handle the details of the sponsorship and TV deals. Marketing and TV rights would be handed over for a guaranteed sum of money to an intermediary who would sell them on. To cover the last part, the selling of TV rights and sponsorships, Dassler created a marketing company called ISL, short for International Sports and Leisure, and established an office across the street from FIFA headquarters in Zurich. The combined effect of Havelange’s two insights was to covert FIFA into a sort of hydraulic cash-flow machine. Dassler and Nally brokered deals with huge companies — Coca-Cola was the first to sign on, in 1975. The money flowed into ISL, which paid FIFA a fixed fee for the rights. To enjoy exclusive access to the rights, ISL also made off-the-books payments worth tens of millions of dollars to FIFA executives.7 To preserve the power structure, FIFA ExCo members funneled resources — and ISL money — to the regional confederations that supported them. The people at the top made deals with big companies, then filtered cash to the people at the bottom in return for the votes that let them make the deals. Havelange reigned at FIFA for 24 years and kept the machine working through sheer grandiose force of personality. (Late in his career, when the Swiss were competing with the French in the race to host the 1998 World Cup, they nominated Havelange for the Nobel Peace Prize and they still lost.) When he announced his retirement in 1998, the race to succeed him pitted Lennart Johansson, the Swedish president of UEFA, against the oleaginous Blatter, who was then FIFA’s secretary general. Johansson had a reputation for incorruptibility — it was thought he might open the books. Blatter was Havelange’s protégé. Blatter won, 111-80. When asked after the election about rumors of improprieties in the vote, Blatter — always snifflier and more preening than his mentor — openly teased the questioner: “The match is over, the players have already gone to the changing rooms; I will not respond to this question.” The investigative journalist Andrew Jennings records in his book Foul! that Havelange’s allies in Qatar were rumored to have paid $50,000 each to delegates who agreed to vote for Blatter. In a savory twist, the Qatari bribes that secured Blatter’s election were dealt out by the candidate’s loyal friend, future anticorruption advocate Mohammed bin Hammam. Swiss law, that wonderfully flexible instrument, didn’t formally prohibit bribery until 2000, and even then nonprofit sporting entities were made exempt. FIFA’s ethics code does include a bribery provision, Article 11.1, which states unambiguously that “officials may not accept bribes” — but then FIFA operated without a written code of ethics until October 2004. It’s possible, amazingly, that the worst behavior of the Havelange and Blatter eras was neither illegal nor expressly proscribed by FIFA policy. Which raises the question again: If FIFA corruption is simply a closed system, detached from reality, a mechanism for assigning World Cup sponsorship rights, and none of the actions it entails are illegal, then where’s the harm? Surely we aren’t expected to weep when one multibillion-dollar company loses an advertising opportunity because another multibillion-dollar company is better at cheating. So as long as the games are good, why does it matter if FIFA is corrupt? 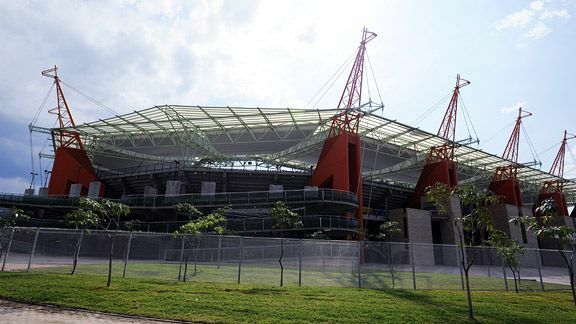 One of the most striking venues constructed for the 2010 World Cup in South Africa was Mbombela Stadium, in the Mpumalanga province in the northeast of the country. Seating just shy of 41,000 people, the stadium rises out of open land, a silver disc ringed by jutting roof supports designed to look like colossal orange giraffes. This was where tiny New Zealand held Italy, the defending champion, to a draw in one of the most memorable matches of the tournament. All in all, Mbombela hosted four World Cup games. The cost to construct the stadium that hosted those four games was initially estimated at about $80 million; the final tally was closer to $140 million. Construction was funded by public revenues — by taxes. Two schools were bulldozed to make room for the stadium. Parents and children from the nearby village staged protests; as the New York Times reported last March, police “dispersed them with rubber bullets.” Local politicians in Nelspruit, the provincial capital, began turning up evidence of massive graft surrounding the project. In 2008, Jimmy Mohlala, the head of the local council, came forward with evidence that an official named Jacob Dladla had conspired with the stadium’s contractors to effectively steal public funds. The ANC held a meeting to consider the allegations, the outcome of which was that they left the accused, Dladla, unpunished and demanded Mohlala’s resignation. “The ANC has its reasons for taking its decision, which will be communicated to the public in due time,” the party spokesman said. Mohlala persisted, refusing to resign and announcing that he planned to file charges against a company called Lefika Emerging Equity, which had won the contract to manage the stadium project. Lefika was co-owned by Bobby Motaung, the heir of the South African soccer dynasty that also controls the powerful Kaizer Chiefs team; its CEO, Chris Grib, had fled the country in 2008 after being implicated in a tax-evasion case. Mohlala claimed to have evidence that Lefika had forged a government document and committed bank fraud. Then, on January 4, 2009, two men wearing ski masks showed up at Mohlala’s house. According to some sources, they started an argument about parking their car. Then they drew guns and shot Mohlala’s 19-year-old son in the ankle, shot Mohlala in the shoulder, and fled. Mohlala died on the way to the hospital. FIFA has been silent about all this. The past four World Cups to be awarded, representing 16 years of FIFA’s work and tens of billions of dollars in revenue, have charted a line straight down the Democracy Index, from South Africa (30th place) to Brazil (47th) to Russia (107th) to Qatar (137th), where political power is hereditary and homosexuality is a crime. FIFA demands a byzantine range of legal and tax immunities, for itself and its sponsors, from countries that want to stage its marquee tournament; South Africa, where more than half the population is below the poverty line, collected no tax on the $3.5 billion the soccer group inhaled from the event. It’s not that liberal democracies are unwilling to make similar concessions. But when you’re accustomed to being bribed, exempted, accommodated, and indulged — when you never want to pick up the check — in some ways the worse the partner, the better. FIFA corruption matters, in other words, not because the integrity of the ExCo makes much difference to the average American or European fan, but because FIFA isn’t a closed system. Its decisions, however farcical in themselves, open the door for better or worse things to happen elsewhere. Old men fluttering about knighthoods in Asunción lead to exploitation and murder in South Africa. “Society is full of devils,” Blatter once said, “and these devils, you find them in football.” For all that they act like minor Dickens villains, FIFA executives are not sequestered in a novel; they impact the real world. Preparations, as always, are moving ahead for the next World Cup. Brazil 2014 will be a comprehensive spectacle, soccer’s triumphant return to the country where Nike thinks it began, and the fireworks displays will drop showers of money on FIFA. The man in charge of the preparations, Ricardo Teixeira, is a stocky 64-year-old Brazilian with a mobster’s neck-wattle and a plutocrat’s blunt eyes. He is also João Havelange’s former son-in-law. Teixeira was married to Havelange’s daughter Lúcia for nearly 30 years; they divorced in 1997, the year before Havelange retired. He was named in both Lord Triesman’s testimony and the BBC Panorama investigation as one of the corrupt eminences of the ExCo, a charge to which he responded, with characteristic subtlety, by vowing to make English soccer’s life “hell” as long as he sat on the committee. Beauty and money, production and reproduction, fortune and misfortune and riches. There are signs that the old Havelange coalition is starting to break apart, that Blatter’s grip on FIFA is weakening. Bin Hammam turned on him; proposed changes to Swiss law might threaten FIFA’s tax status; the press is forever getting closer to the box of dirty secrets. The domestic clubs, who increasingly hold the real power in soccer, are correspondingly restless; Karl-Heinz Rummenigge, the great German striker who now heads the European Clubs Forum, has said that “I don’t accept any longer that we should be guided by people who are not serious and clean.” Havelange, now 95, is being investigated by the International Olympic Committee for accepting a seven-figure bribe. Blatter’s strongest reform effort to date — appointing Henry Kissinger and Placido Domingo as anticorruption consultants — has met with widespread derision. If nothing else, the average age of the ExCo is 64 — surely one of the main reasons FIFA broke its own tradition by awarding two World Cups at once last year. Some sort of change must be coming. But Blatter has withstood crises before, including the sudden collapse of ISL in 2001, which revealed yawning holes in FIFA’s books. Somehow or other, he always seems to emerge at the end, smiling above the rubble and purring that it would be reprehensible to assume he masterminded all this. This may be because he understands better than anyone, Havelange included, that while FIFA might influence the real world, it is never finally judged there. Reform movements and protests are local and particular. FIFA’s plane is abstract and global, the bright, hard everywhere of logos and sponsored theme music. To thrive, Blatter doesn’t have to make the World Cup a force for good. He just has to make it look good on TV. For 2018: England, Spain/Portugal, Russia, Holland/Belgium. For 2022: the United States, South Korea, Japan, Australia, Qatar. This past May, Mel Brennan wrote a hugely entertaining and bizarre account of working for Blazer at CONCACAF, including strip clubs, massages, and the AMEX Centurion Card. This past weekend, the investigative journalist Andrew Jennings reported that Blazer is being investigated by the FBI. In an unrelated coincidence, France hosted the World Cup in 1998. For instance: Triesman accused Worawi Makudi, the ExCo member from Thailand, of asking him to schedule a friendly match between England and Thailand and to give Makudi the TV rights. In May 2010, the FA did schedule a friendly match with Thailand, which they canceled in December after Makudi failed to vote for their bid. Other Rous winners: In 1973, two months after the Pinochet coup in Chile, he ordered the Soviet Union to play a World Cup qualifier against the Chileans in Santiago. The only problem: The Pinochet regime had been using the stadium as a death camp. “In order to stage the game against the Soviets,” Tim Vickery has written, “the remaining prisoners were transferred or released and the bloodstains hurriedly cleaned up.” The Soviets refused to play the match. Rous threw them out of the World Cup. This was the subject of a trial that took place in Zug, Switzerland in 2008. The bribe-takers unsurprisingly appear to have included both Nicolás Leoz, he of the many knighthoods, and Ricardo Teixeira. Last October, Mpumalanga police arrested three suspects in the murder, but subsequently released them for lack of evidence. In March, the police dismissed two officers who were themselves now seen as suspects in the killing.